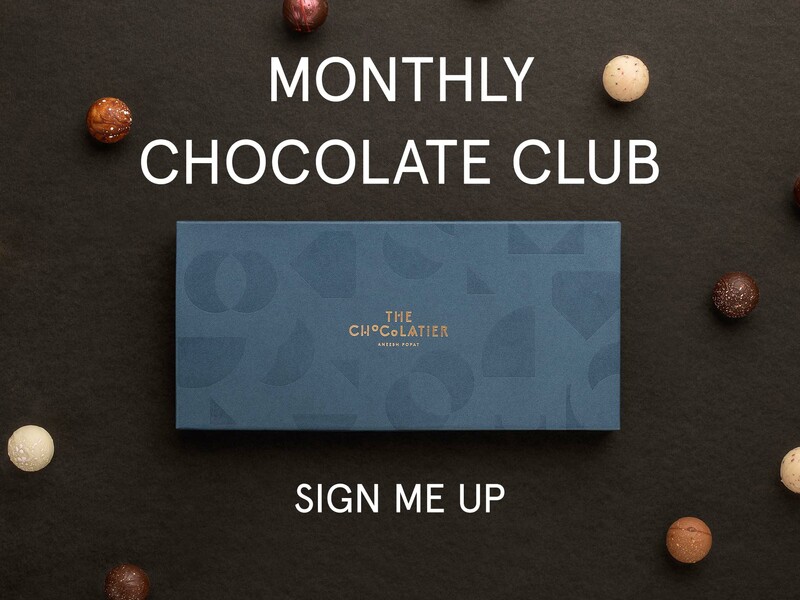 Welcome to our chocolate subscription club! We love innovation and creativity and we want to share our most exquisite flavour collections with you. Inspired by moments and memories that have captivated us, we infuse this imagination into our chocolate creations. So, every month you will enjoy a selection of fresh water ganache truffles and pralines, each with a unique theme. We only source the highest quality ingredients, never use artificial preservatives or flavourings, cream, butter, gelatine, gluten or oil, to bring you healthier truffles, the ones you can indulge in, virtually guilt-free! Coffee - Milk chocolate coated coffee ganache. Tea - A luscious white chocolate infused with green tea matcha. Granola - An apple & cinnamon granola truffle. Dark chocolate (cacao, sugar, cacao butter, SOYA lecithin, vanilla), milk chocolate (sugar, cacao butter, MILK powder, cacao, SOYA lecithin, vanilla), white chocolate (sugar, cacao butter, MILK powder, SOYA lecithin, vanilla), muscovado sugar, fruits, spices, decorations (cacao butter, natural colours (beetroot, E100 (curcumin), E171 (titanium dioxide), E172 (iron oxide)), E133). Allergens in CAPS. 3-4 weeks life from delivery. My youngest daughter and I ate them far too quickly, they were so good, so I have ordered an Easter egg box! I ordered these chocolates from Canada,, one box to be delivered to me in Ottawa and the other as a gift for a relative in Brighton UK. Having ordered chocolates from Aneesh in the past, when I was in the UK, I was curious to see how well the product would travel and how long it would take. My niece in the UK was overjoyed with her box of chocolates and is now a big fan and customer of The Chocolatier! I too was delighted with my gorgeous selection, they were in perfect shape after a very quick 6 days in transit, fragrant, original, so flavourful and satisfying! Always a feast for the senses, Aneesh's work is world class! Thank you and Happy Halloween! The Chocolate continues to dazzle with creativity. The " Everlasting Gobstopper" Raspberry, Spicy & Pop Rocks ......Phenomenal !!! !